As an immediate response to the declared state of lawlessness by President Rodrigo Duterte in view of the recent bombing in Davao, the Provincial Peace and Order Council in Bohol chaired by Gov. 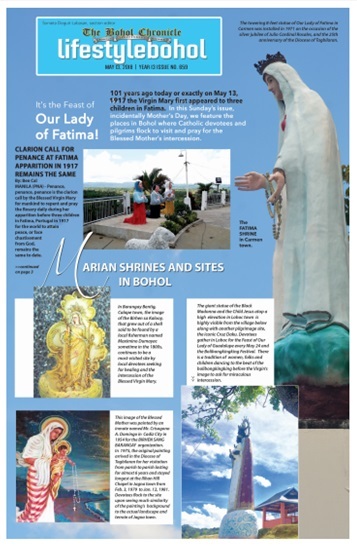 Edgar M. Chatto takes intitiative in safeguarding the entire province of Bohol. As support for the mandate from the PPOC Chair Gov. Edgar M. Chatto, a close monitoring of incoming vessels in the entire province of Bohol is to be implemented in full swing. This call heads towards the participation and cooperation of the municipal mayors and barangay captains in giving a tighter security especially in coastal areas. The Mayors and Barangay Captains of Coastal areas are then advised by the Governor to conduct a proactive monitoring of possible entry of unknown seacrafts in municipal waters and coordinate closely with police and army. This is a collaborative measure to be exerted not only by members of the PPOC (Provincial Peace and Order Council) but also every Boholanos in ensuring public safety. Currently, TARSIER 117, being part of the PPOC task force, is on guard for possible reports from law enforcement intelligence groups. Expect random checkpoints, the unusual presence of uniformed men in the streets and peacekeeping authorities on full alert, warns Bohol deputy chief for police operations, PSuperintendent Ricky Delelis in a radio interview. This as the recent bombing in Davao City pushed President Rodrigo Duterte to declare a state of lawlessness in the entire country to suppress criminals from further sowing fear and terror and violence. Speaking at a local radio program, Supt Delelis narrated that a bombing has claimed at least 14 lives and has sent scores of injured victims to various hospitals in Davao City, government sources said. The attack, later owned by belligerent terror group Abu Sayyaf, has also people spreading speculations of the start of another martial law in the country. But both Malacanang and Bohol police have assured there is no Martial Law and there has not been a suspension of the writ of habeas corpus. Earlier on, possibly picking the potential misinformation of the declaration as already a state of martial Law, Presidential Spokesperson Ernesto Abella explained that the state of lawlessness, is rooted in Article VII, Section 18 of the constitution. Section 18 for the Philippine Constitution says the President shall be the Commander-in-Chief of all armed forces of the Philippines and whenever it becomes necessary, he may call out such armed forces to prevent or suppress lawless violence, invasion or rebellion. This means, in a state of lawlessness, the commander in chief calls on the military to do law enforcement operations to complement and supplement the capability of the police to suppress lawless violence. President Duterteâ€™s declaration of state of lawlessness is limited, explains Malacanang. The right of the person not to be put into unlawful detention without due process in a competent court of law is still upheld, Malacanang said via an infographic circulate in the morning of September 3. The declaration is limited such that he can only call out the armed forces to suppress the lawless violence, spokesperson Abella said. The declaration is a different case [against martial law] which is declared when the country is in the eminent danger of invasion or rebellion. Since the moment of the bombing, posts on social media have put in a number of unverified information, some of them shared, forwarded or reposted that it caused panic among residents. Over this, Philippine Information Agency director general Howie Clavite has called for sobriety during the countryâ€™s tough times. â€œWe call on our kababayans to exercise prudence and to please stop spreading unverified reports related to the current situation in Davao, public safety and/or national security,â€ Clavite said. He also called for the responsible use of technology and social media. â€œIt is very easy to share, forward, or repost information and so we call on our kababayans to exercise prudence and to please stop spreading unverified reports, Clavite urged. And in the form of an advice, PIA through Clavite said people must avoid crowded spaces, but although it is not any cause for alarm, it is always wise to be cautious. With the declaration, local authorities have been asking people to be vigilant and to report to authorities any sighting of a person who acts weird and in the act of committing a crime. With the random checkpoints all over the country, PIA goads everyone to cooperate during checkpoints. Stop the engine, turn off your headlights, and turn on the cabin lights for the street inspection, Camp DagohoyÂ authorities here said.